The exhibition will feature the artwork of Paige Bennett, Sandra Charles, Amanda Riff, and Jenée Rue Sastry. Each BFA candidate contributes their unique vision as represented by a concentrated body of work developed to demonstrate their readiness to enter the professional art world upon graduation. 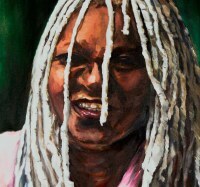 My paintings celebrate the empowerment of African American women and their quest to be authentic. Using hairstyles as a point of reference, my work explores the history behind the need to conform, referring not only to the complexity of the past but how it relates to a contemporary acceptance of one’s own culture and heritage. They focus on the struggle between self and society, and how past conflicts can weigh down one’s own self-realization. My paintings also portray the acceptance of who we are and how that acceptance erodes old, deep rooted ideas of the past and replaces them with the beauty of our culture and heritage. I actually have two professors that helped me understand and achieve my goal, Gabrielle Mayer and Mark Priest. I am truly grateful for their expertise and patience. Gabrielle was essential in helping me refine the concepts of my work, and she helped me understand who I am as a painter. Mark guided me to focus on the essence of figurative painting and to be able to really see what I was actually seeing. The guidance of both of these professors forced me to refine my technique and gave me the strength to become an artist. After I graduate I will be retiring within from my job to pursue a career as a full time artist. I am interested in how we perceive and make sense of what we see in the world around us. One of the many remarkable things we have learned is that our minds are pattern-seeking, categorizing machines. Equally fascinating to me are the dynamic and consequential effects of attention — as we focus, some things sharpen and some things necessarily blur away. While these mechanisms help us manage a world of stimulus and prioritize where to place our attention, they can also lead to oversimplification that leaves us blind to other things. How we focus literally creates our reality. 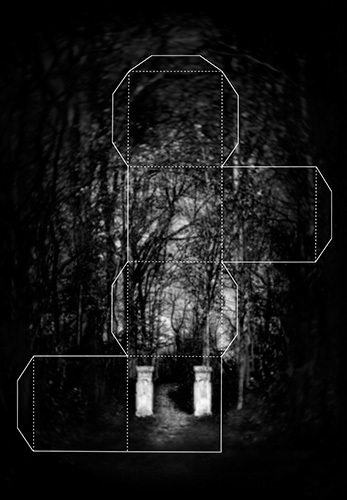 My final BFA Thesis project is a photographic series called The Box Maker. It represents my exploration into some of these inner workings. I am particularly intrigued by the force our pattern-making mechanism exerts on the external world, creating labels and boundaries wherever we look — be they literal or symbolic. In this series, I use boxes as a metaphor for this process. While the imagery is largely rooted in the representational world, it is also constructed. I have altered the imagery during both capture and post-production to suggest an interior landscape — the root of the subconscious, emotion and memory. I am interested in considering the ever-present and constructed nature of boxes and the potential power of their malleability. Yes! Professor Mary Carothers and Professor Mitch Eckert were instrumental in helping me unearth and refine the concept I wanted to explore. Both are gifted educators who manage to strike a beautiful balance between teaching complex and varied techniques while supporting the development of meaning and the student’s own personal vision. I feel honored to call them mentors. I will continue to make artwork – always. I am also looking for opportunities to bring my newly acquired Fine Arts education to an organization whose mission is to educate, engage and create amazing cultural experiences.